Whether you like spicy, sweet or regular, our exciting flavors for every adventure. Same perfectly textured delicious premium beef created with all the garlic lover’s out there in mind. This fantastic flavor combines some Creole seasoning, some secret sauce from South of the Border, a touch of Habanero, and most importantly, some gnarly garlic. It’s good enough that your date will still want to kiss you even after you’ve had a bag or two! 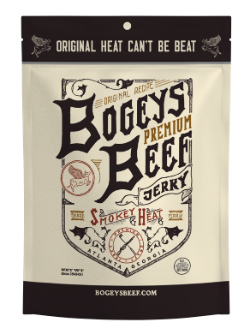 Do you like your jerky with a little more bite!? With Smokey Fire, we take the winning formula of Smokey Heat and twerk a little more spice and kick into it to satisfy your appetite for BITE. Get you some Smokey Fire and let’s see what you’re made of. Can’t handle the spice of Smokey Fire? This combination of chili, spice, a touch of garlic, and a hint of apple and raisin won’t disappoint. The recipe is a closely guarded secret, and we doubt you can take one bite and put the bag down. In fact, we encourage you to try! All that flavor infused into Lean Eye of Round Beef cooked with real smoke to provide that perfect jerky texture. I can assure you Bogey's Beef is the best beef jerky around. Ever since my campus store started selling it, I can no longer eat any other brand of jerky because it just doesn't taste the same..
Don't live near one of our awesome retailers? That's okay! 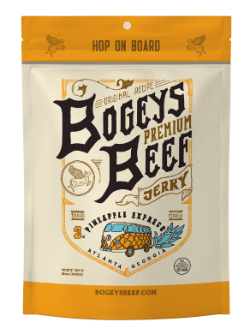 Shop online to get our beef jerky and swag delivered right to your doorstep. Send us your best pictures and videos to bogeysbeef@gmail.com and we will upload them to the Bogey's Buddies page. We love to see ya'll enjoying our beef. Hi, we're happy to hear from you and answer any question about our products or production. Or if you just want to rave about our beef, feel free to do that too!